After proving themselves as one of the most stunning musical success stories of the last decade, Los Lonely Boys continue to creatively draw from and meld Blues, Classic and Modern Rock, Soul and beyond. 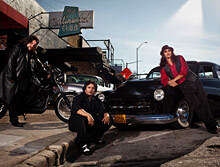 Join us as the Texican Rock'n'Roll trio of brothers take the stage for a rare discussion and performance. Led by Vice President of The GRAMMY Foundation Scott Goldman, you'll hear Los Lonely Boys in an engaging conversation about their ever-expanding musical vision, their roots playing behind their father as kids in cantinas and honky-tonks as well as their newest album Rockpango, set for release on March 29. An audience Q&A and performance will follow.